When planning an event or a campaign there are many things to consider. The people to invite, the location to have the event at, planning of the agenda etc will be on the top of your list. However sometimes you might not focus too much on deciding on your promotional material and how they are made. This can be a costly mistake, because some weather conditions and outdoor conditions can be harmful and damaging to outdoor signage and promotional material. Therefore consider what material will be outside. Feather flags: also known as a Bali flag, this popular outdoor promotional tool is very versatile and popular because of the large print area. They also last long in wind conditions and flap more to attract attention. They come with a standard rod for placing on the ground. Flying flags can be replaced as and when required with different messages, so you can use one rod interchangeably for different messages. 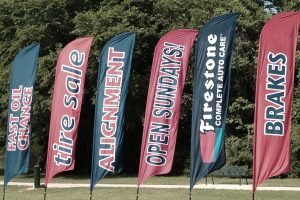 Teardrop banners: found under the category of flying banners, these come with a unique shape and are ideal for very windy conditions. They are also very light weight making them easily transportable. The unique design enables them to rotate or pivot in the wind making it very durable for many conditions. The design also makes sure that the promotional message can easily be viewed from any location. It is however important to keep promotional message simple to make them easily readable and to stand out. Verticals: these use longer vertical rectangular shaped material to print the promotional message on. They are also sometimes called national flag or block flags because of the shape. They are distinguished by their ability to be raised high on flag poles and rods so as to be seen from very far off. Therefore when planning an outdoor campaign, consider some of these popular options to make your message stand out. The outdoor flags are proven to be cost-effective and easily transportable making them very popular. Why To Choose Medical Marketing Agency. How Is The Modern Technology Used In Video Making Today?